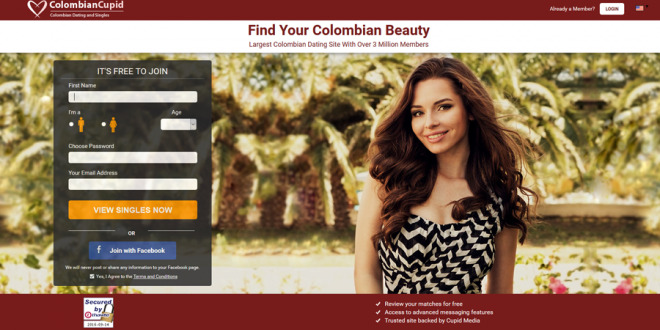 ColombianCupid is still the GOTO site for meeting women and men from Colombia. Now running for eight years it has amassed a pretty big following with people seeking a mix of relationship types from marriage, flings to friendship and courting. If you want to find a Colombian bride, husband or just meet someone from there for romance ColombianCupid is your best bet. Luckily the site isn’t just filled with dreamy men hoping to meet some impossibly gorgeous Colombian babe. Though you will find a fair few there. Nowadays you’ll find a good many Colombian women taking the driving seat and actually putting up on their profile exactly who they want to meet. Rather than leaving things in the hands of fate. The first thing to realize is that Colombian Cupid isn’t a marriage bureau so don’t confuse it with the many “foreign bride arranging sites” out there. There’s no pressure to hook up or meet anyone. You can just join up and see what happens without being prompted to signup for tours or other meeting services. Though the site will help you if you want to do that. In short ColombianCupid is ideal for those who just want to join a community, socialize and perhaps meet someone for a date. Colombian women are very tactile but they also want to see who they’re talking to. Empty profiles or profiles without any enticing pictures are given the elbow. Make sure you upload some good ones. They don’t have to be professionally done but its better than just uploading a few selfies and hoping for the best. Try to stand out with something that’s unique and interesting. Remember the site carries thousands of photo profiles so if yours doesn’t stand out the chances of being passed over are pretty high. Have any exciting hobbies or been somewhere recently? Put it in the tags area. Think of these like Twitter hash tags. They let people find you by what you’re in to. These can also be a handy way to find people in unexpected ways. For example searching for things outside of the standard search form. Only a few bother to get verified but it can dramatically increase the amount of interest your profile with get. A good profile should take more than 15 to 30 minutes. You can use ColombianCupid in free mode but you’ll have to put up with a few restrictions. The free account will let you talk to other paying members who contact you first. Once they start to talk you be able to carry on as long as one of you remains a paying member. For men, having a paid account is essential. You can stick with the free account but the number of females who’ll be prepared to talk with you will be very small. A lot of women on there are stuck on free accounts either because of lack of funds or because they don’t see why they should pay to talk to a guy. This means guys have to step up to the plate and actually become fully registered. Becoming a fully registered member gives you a lot of other perks. As well as unrestricted messages you can also use the video profile feature and advanced searched. Search for your matches by body type, interests, personality, and of course the basics such as age and where they live. The search settings are very easy to use and you’ll quickly be pulling up profiles of new matches. One good thing about ColombianCupid is that they don’t bombard you with emails about new members ever day. In fact the emailing is fairly light compared to some other dating sites. Flirts let you get the conversation off the ground. If you want to find a Colombian bride, husband or just meet someone from there for romance ColombianCupid is your best bet. Not only is it the biggest, but it’s also the simplest and most enjoyable. This is not a matchmaking site: you’ll have to do most of that yourself. But it’s a great place to go and just hang out and make some Colombian friends. Summary : If you want to find a Colombian bride, husband or just meet someone from there for romance ColombianCupid is a good choice. Plenty of members and packed with useful features. Previous: InterracialCupid, Thought About A Mixed-Race Relationship? Next: IndonesianCupid – Uniquely Asian Dating?